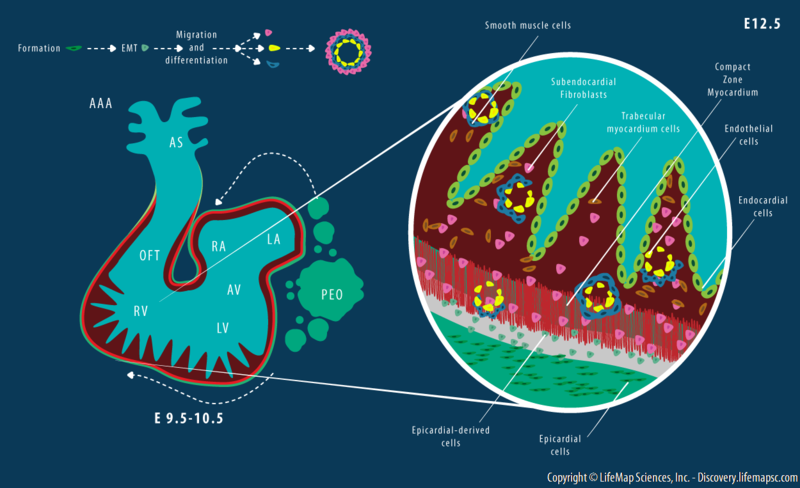 The development of epicardium derived cells. Cell aggregates from the proepicardial organ (PEO) migrate between E9.5-10.5 and envelop the heart tube to form the epicardial layer (left panel). Epicardial cells (dark green) then proliferate, undergo epithelial-mesenchymal transition (EMT) and migrate to the upper layers of the myocardium compact zone (red zone) and trabecular myocardium (brown cells), to form the coronary vessels (yellow and dark blue cells) and subendocardial fibroblasts (pink cells) by E12.5 (right panel). Endocardium cells are depicted as light green cells. Abbreviations: AAA, Aortic Arch arteries; AS, Aortic Sac; OFT, Outflow Tract; RV, Right Ventricle; LV, Left Ventricle; AV, Atrioventricular Septum; RA, Right Atrium; LA, Left Atrium.